On March 1, President Trump announced his plan to impose 25% tariffs on steel imports and 10% tariffs on aluminum. This announcement was widely met with criticism both at home and abroad. More than 100 Republicans from the House of Representatives wrote a letter to the White House asking the President to “reconsider broad tariffs to avoid unintended negative consequences.” The letter also expressed concern that the tariffs would harm close U.S. allies, such as Canada. Others, including Democratic Senator Joe Manchin from West Virginia, praised the tariffs for protecting American industries. In response to Trump’s announcement, the European Union threatened to levy tariffs of its own on a wide variety of U.S. products, including classic symbols of American culture such as peanut butter, blue jeans, and Harley-Davidson motorcycles. Chinese Foreign Minister Wang Yi also warned that “China will certainly make an appropriate and necessary response.” The tariff announcement came as Liu He, President Xi Jinping’s top economic advisor, was meeting with U.S. officials in Washington DC. President Trump signed the orders on March 8. The version he signed excluded Canada and Mexico from the proposed barriers to steel and aluminum imports. After further negotiations, the tariffs went into effect on March 23 with exemptions for close allies of the U.S., meaning the European Union, Argentina, Australia, Brazil, South Korea, Canada, and Mexico all avoided the heavy tariffs. 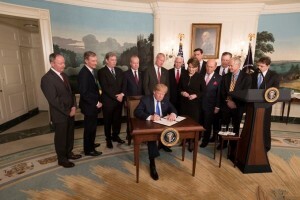 On March 22, just three weeks after his initial announcement, President Trump signed a presidential memorandum imposing tariffs on China’s high-tech sector as well as limiting opportunities for Chinese investment in the United States. President Trump took these actions in response to the results of an eight-month Section 301 investigation into China’s theft of American intellectual property (IP). The investigation concluded that China has been engaging in unfair trade practices. Among these practices was a requirement that foreign companies turn over important technology, usually protected by patents, to Chinese firms before they would be allowed to do business in China. The U.S. Trade Representative’s office will develop a list of targeted products and will release it to the public on April 6. This list will be subject to public feedback before being finalized. The stock market dropped sharply immediately following Trump’s announcement. However, by March 26 the markets were already recovering in response to reports of ongoing talks between U.S. Treasury Secretary Steve Mnuchin and Chinese Vice Premier Liu He. Still, numerous business sectors in the U.S., including Wal-mart, Nike and forty-five various trade associations, have expressed concern about the tariffs. Some are worried about added costs for manufacturers, which will then be passed on to consumers. Many believe this situation will invite retaliatory tariffs and ultimately devolve into a trade war. A good deal of President Trump’s campaign focused on the trade deficit and unfair practices between the U.S. and China. These tariffs are his biggest steps so far toward affecting the trade deficit. Although President Trump and President Xi appear to have a congenial rapport, the U.S. and China have a particularly tense relationship overall. As the two largest economies in the world, both countries must exercise caution in order to avoid a trade war with potentially catastrophic, global consequences. The U.S. and China may be able to avoid the deterioration of this situation through continued talks between high-level officials and cooperation with multilateral organizations such as the WTO.